And also this year i will have an geeklist with the games i purchased at Essen. This year it is a lot shorter then the years before due to some budget problems and a lot of dissapointing games. Tales & Games: The Three Little Pigs supposed to be better than King of Tokyo. OMG better than King of Tokyo! Tales & Games: The Three Little Pigs would be a must have. I love King of Tokyo! So at Spiel i got an brief explanation of Tales & Games: The Three Little Pigs and i felt i needed to buy Tales & Games: The Three Little Pigs . I have played Tales & Games: The Three Little Pigs now a couple of times. I am not sure Tales & Games: The Three Little Pigs would beat King of Tokyo but Tales & Games: The Three Little Pigs is still fun playing with a friend of mine. She is not a gamer type. Asked her to play a game. She did not feel like it but she was generous and offered me the chance to play a game. 'A game'?? We played 5 games at the end! So Tales & Games: The Three Little Pigs can not beat King of Tokyo yet but is really a lot of fun. The things i heard about Koryŏ were good. I read the preview of Dominique at 'De Tafel Plakt'. That is why i bought Koryŏ instantly. Koryŏ was signed for me by the designer and i have a good game for testing now. I did not playtest Koryŏ yet. At the thursday on Spiel 2013 i was demoing games for White Goblin Games. The game i had to demo was Pasha. 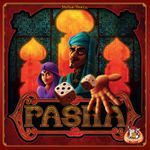 Pasha is easy to learn and in my opinion a game with a lot of interaction. Pasha is a good game to play with friends and have a lot of fun. So i think Pasha will be a great addition to my collection. I haven't had the chance to play Packet Row. But i did have a chance to het a good look at Packet Row. 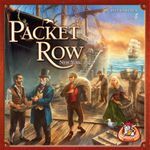 I have had a very good expanation of Packet Row and i thought Packet Row could be a very good addition to my collection. Packet Row went home with me and i hope to play Packet Row soon. At the Saturday at Spiel i played a couple of rounds of Trains and Stations. A game with trains is most of the time a good combination for me. A game for 3-5 players is most of the time a bad combination for me. But i did like Trains and Stations that much, i could not refuse buying it. I hope Trains and Stations will appear on the table soon. I am a Funkenschlag fanatic. I have everything that goes with Funkenschlag. But today i decided that i did not feel like buying Power Grid: Australia & Indian Subcontinent. I have a lot of maps for Funkenschlag and they can not be played all at once. So for the first time in years i made the decision not buying a new Funkenschlag map.